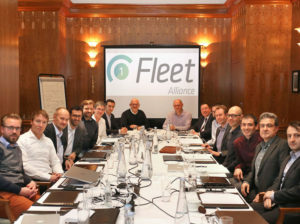 The landmark meeting at London’s Savoy Hotel saw the 17 members of 1-Fleet Alliance agree to forge closer ties. At a landmark meeting at London’s Savoy Hotel, 17 members of 1-Fleet Alliance – a group of telematics companies that together track more than 500,000 vehicles throughout Europe – took the decision to form a new commercial body. Dubbed 1-Fleet Corporation, the organisation has been created to meet objectives including collaboration and networking, promoting innovation and telematics industry standardisation, as well as joint marketing and commercial agreements. 1-Fleet Corporation will also be able to offer pan-European telematics solutions, drawing on individual members’ expertise. Pedro Zamith, a well-known figure in the automotive technology arena, was appointed to oversee the development and launch of commercial propositions on behalf of 1-Fleet Corporation. The new alliance is intended to benefit commercial fleet operators from the combined strength, global expertise and innovation brought by the diverse membership of the group. The group is also looking for partners in the fuel card and leasing/finance sectors for “synergetic offers”.